Well, I'm ahead of myself this year for Father's Day! I have used this weeks sketch created by Sketch Saturday and enjoyed it so much I will definitely use it again. 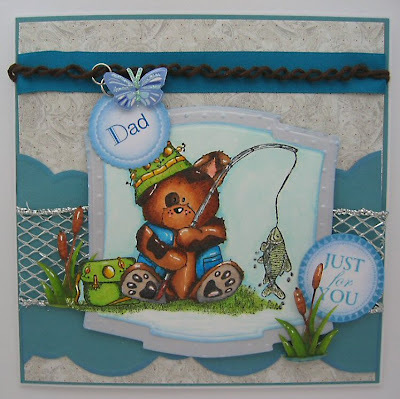 I purchased the new Daisy & Dandelion stamp set called "Dandelion goes fishing" for £3.99. It's a cute design and worth the money because you get other stamps with it. 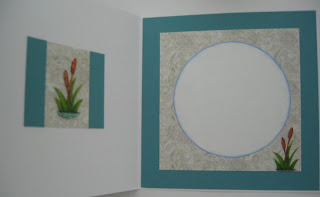 To make the card I have used: Paper/Card - Basic Grey Boxer Pad & Bazzill Card in a teal colour. Silver stardream paper Ribbon - Satin ribbon 10mm wide, Silver wired ribbon 45mm wide and brown wool Stamps - Daisy & Dandelion clear stamps, Papermania Just for You stamp. Free this month with a craft magazine. Tools - Nestabilities Label die, Keepsake Romance Embossing Board Here is the sketch and the inside of the card. Thanks for looking.